With a high octane, blood-spewing live show and impeccable lineage – frontwoman Arrow de Wilde is the daughter of photographer Autumn – this fast-rising teenage quartet might just be the sonic defibrillator rock needs. Produced by Ryan Adams, their 10 song, 28-minute (!) debut rips from the speakers, every note played with a gritty determination to prove that new blood can be pumped into narrowed arteries. So we get blatant nods to Nirvana (Full Of Pride), The Stooges (Chicken Woman) and The Runaways (Love’s Gone Again), all delivered by the 19-year-old de Wilde in the manner of a world-weary Courtney Love. It’s ironic, then, that their most telling moment comes when they take their foot off the pedal. Set against a backdrop of shimmering guitars, Tears has de Wilde tapping into her everyday anxieties, sighing ‘You keep telling me you’re coming, but all I get is tears’, every inch a modern-day Sister Morphine. 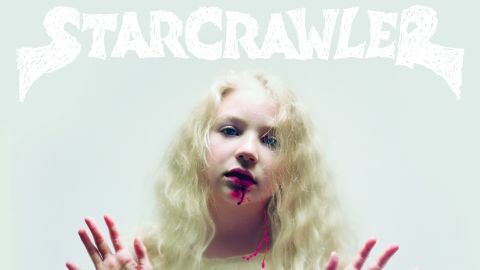 They’re not world beaters yet, but Starcrawler’s creepy appeal shouldn’t be underestimated.